ARC'TERYX Narin Hoody. The Narin Hoody is designed for urban life with alpine inspired performance, freedom of movement, and exceptional craftsmanship. The Bast nylon face fabric is a light, durable matte taffeta with a soft silky hand. 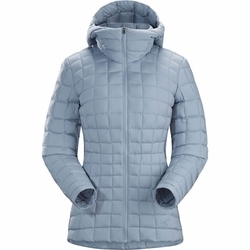 A durable water repellant finish (DWR) repels moisture and lofty 750 fill power goose down cuts the chill. Lightweight Polartec Micro Velour fleece side panels reduce bulk and streamline the fit. Hidden zippers secure the hand pockets.